I didn't go out last weekend so I'm using a shot taken in the summer. This was taken at the British Wildlife Centre. I wasn't intending to post this shot, I took it for myself as I was so suprised to see the badger awake. I have been to the BWC many times but the badgers have always been fast asleep under the ground. The Badger is one of Britains' oldest and largest wild animals and is thought to have been present for possibly 500,000 years. The badger is related to the otter, stoat and weasel. It is easily recognised by a white head with a black stripe over each eye and ear. They have excellent hearing and keen sense of smell, although their sight is quite poor. Badgers have very strong bodies, particularly shoulders, short legs and a coat of course hairs. Male badgers are called boars, females sows, and young cubs. Boars are about 1 metre long and weigh 12 to 14 kg, with sows being somewhat smaller. Badgers live in underground tunnels and chambers called setts which are mainly found in woodland slopes, although they can be found in a variety of places, including beach cliffs and coal heaps. Active setts will usually show signs of activity, including footprints, hair, scratch marks on trees, dung pits (also called latrines) and well used paths. Badgers are territorial animals and each social group has its own distinctive scent. They will use dung pits to mark out their territory from other groups. Mating can really takes place all year round. To ensure cubs are not born too early, e.g. in winter when there is less food available, sows undergo delayed implantation whereby the fertilised egg (blastocyst) does not implant in the womb until the end of winter or early spring. Badger cubs are born between mid January and mid March, and emerge from the sett when they are about 9 or 10 weeks old. Cubs become independent of their mother by around the following autumn, and are fully mature by 2 years. Adult badgers are good parents, both protecting and disciplining the cubs whilst also teaching them to forage for food. They are clean animals in that they do not eat in the sett and regularly remove old bedding materials, made up of grass and leaves etc, and replace it with new. 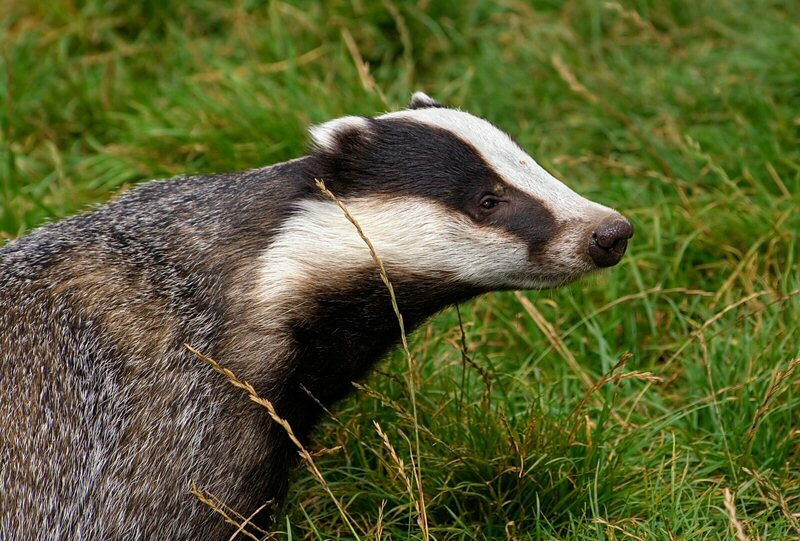 Favourite foods of badgers are earthworms, but they also eat cereals, insects, fruit and small birds and mammals. Amazing baby... I like it! Good detail and focus, nice composition. what a lovely portrait, i love the sleepy expression in his face. Super detail too, and the exposure is perfect. It's nice to dig out and share a favourite of your own sometimes. Hi karen. What a fine shot of this beautiful animal. a friend of mine has got a Badger set in her woods. you have captured this one with sharpfocusing and fine detail. good natural colours. well done TFS. good notes too. A great shot that Im pleased you shared..fine focusing giving a really sharp tight picture..on a sad note last saturday there were 2 badgers at either end of my village been knocked down by cars. I wish people would have thier eyes open when they drive. I guess they can't sleep all of the time! Nice portrait of this Badger - one of many animals I have not seen in the flesh. Good exposure to get the excellent black and white. Nice details of the face and his coat. I love grassy settings - we don't have much of that here. Lovely shot of the Badger, he looks so sleepy and cute, great composition and pose with nice sharp details and excellent colours well saturated colours. Great deatils,lighting and BG,Superb shot. He still looks a bit lazy. Fascinating natural colours. Great details, focus, composition and BG. This fellow could get a leading part in The Wind in the Willows right away! Lovely fur coat, well groomed and captured skilfully to expose him at his very best! well seen & captured, thor. Lovely expression on the face of this cute Badger, looks like he always half asleep all the time! have a good weekend, Karan! This is a shot and a half!!! +++ Sharp and detailed with excellent clarity. Great POV with good eye-contact. Very good composition. Last wednesday I watched a new program on BBC1. Its called The Nature of Britain. They also showed about 10 minutes on a group of badgers. What really intersted me is the difference between the Britisch badger and those from the mainland. The latter lifes more in a solitairy state and the Britisch in groups. The explained that it had to do with the weather and particulary with the rain. Since there is much more rain in Britain, there is more food available for them. So less a struggle to get food and less need to fight for it. I found that part very interesting especially since they live so close from eachother considering the size of the globe. You captured the badger beautifully. The dreamy look is very cute. The details are perfect and I like the fact that you can see the wetness of his nose. The little twinkle in the eye is wonderful. Hi Karen, great shot and what luck! You managed a very well focused shot if taken by surprise. I like the pov showing his handsome markings, light is good and colours wonderul. All nice and sharp. Great work. Just marking this shot for a proper critique later. Hoping that my internet problem will be solved by the evening. Sorry again. The portrait of this species is OUTSTANDING. No need to comment further. Or is there??? I welcome this amazing post with any doubt. Wonderful shot of so beautiful animal. I do not cease to be surprised to work of a Sigma lens in skilful hands. Perfect sharpness and details of the image, wonderful rich colours, brilliant exposure and excellent DOF. I like the exact at high range framing and composition of the picture. Bravo and TFS. Excellent image, nice composition and colors.